When James Frain got cast in Sleepy Hollow, there was hope that with Grimm’s decision to kill off Eric Renard and install a new Wesen royal family Big Bad, there would finally be some momentum on the overarching mythology behind the show. But even though “Cold Blooded” shows a glimpse of Alexis Denisof, credited as Viktor Albert Wilhelm George Beckendorf, introducing himself to Adalind, retaining her legal services, and spying on her hotel room, he’s as much a shadowy, backroom presence as the higher-up villains have always been on Grimm. So far, Nick has dealt with the Wesen world in a boots-on-the-ground fashion, eking out a larger understanding while Sean, Adalind, and the royal family maneuver through a molasses-speed power struggle in Europe. The breadcrumb approach to revealing the larger story at play makes me far less interested in where the bigger story is going. At this rate, it will take the entire length of the series for anything significant to actually happen. The villains in these plots haven’t been an immediate threat other than briefly at the midpoint and end of the second season, with Nick’s confrontation with his captain and Eric’s attempt to kidnap Nick back to Europe. If Sean is simply weaving his way into a resistance organization we don’t follow or understand, no event is going to illustrate what power they hold, and nobody is going to actually explain the situation (here’s where the return of Nick’s mother might come in handy), then I’d just as soon focus on the episodic strides the show makes by binding together the core characters even further. Grimm hasn’t given viewers a reason to care about or root for Sean’s interests outside of Nick, so following him as he returns to Vienna, dodges assassination attempts, and links up with anti-royal rebels only introduces more information that doesn’t clearly have consequences for Nick and the rest of the group back in Portland, since they have not yet journeyed that far away from the city to deal with large Wesen issues. That’s not to say I don’t find the meted out expansion intriguing. But I like that this third season has taken to focusing on incremental growth for Nick, Hank, and the rest of the non-police team in Portland instead of moving them outside of the city to grapple with the larger implications of the minor Grimm revolution Nick has started. Though he doesn’t really understand what’s happened since Baron Samedi attacked him, Nick has been able to use superhuman senses of hearing and smell, along with increased strength, to fend off more dangerous foes. In the first hour, it’s a Wesen take on the sewer alligator urban legend, with a big, sinewy alligator strong guy robbing houses. The twist isn’t particularly well-hidden (a couple brothers), but watching Nick, Hank, and a skittish Sgt. Wu navigate the sewers beneath Portland offered an easy way to build tension. In expanding the mythology of the show within Nick’s episodic case plots, it allows the show to bring in things like that vambrace with the spring-loaded blade, tie it into Nick’s growing knowledge from having the Airstream as a resource (he really needs a better GrimmCave space), and vary the fight scenes so that it’s not just Nick beating up on random Wesen and swinging a favorite axe every time. He’s getting better with hand-to-hand combat—and his increased strength is a simple way for the show to wave away any imbalance in how imposing an opponent appears. In fighting the alligators (honestly I’m guessing on the spelling, but I’ll venture “gellumkitis”), Nick saves Hank, uncovers another bit of Wesen history—the creatures were at one time Roman guards, not nearly as ridiculous as Hitler and the Fuchsbau coins—and finds a new nickname he likes in “Dicapitare.” There are not enough episodes that shift more heavily into serialized plot development over an in-episode case, but when that serialization doesn’t involve Nick, I’m more than happy to watch the usual fantasy/supernatural police investigation unfold instead of watching more of Adalind rubbing bloody salve on her pregnant belly. Good Christmas episodes are the ones that find a way to be representative episodic installments of the show outside of the requisite holiday elements. But what really separates the great episodes is finding a way to wind those holiday-specific parts into the fabric of the plot. My favorites—Scrubs’ “My Own Personal Jesus” or Community’s “Abed’s Uncontrollable Christmas”—create stories that reveal a lot about the characters through holiday plots. But “Twelve Days Of Krampus” deals in parallel stories: one in Europe where Sean, Adalind, and Viktor never meet; one, with Nick and Hank tracking down the mythical creature Krampus (“Santa’s evil twin”); and one, the far more domestic and saccharine emotional arc that feels like it fulfills a sentimental quota. Over in Europe, Sean meets with a resistance—I saw “a” and not “the” because it’s not quite clear what this resistance represents or how the royal families really affect the world—and they’re capable of taking out the Verrat agents lying in wait for them occasionally. And he’s made himself known to Viktor by getting into Adalind’s hotel room. The three of those characters track along without really interacting, and the other two plots are hermetically sealed away as well, not affecting this one. I think that’s my biggest problem with “Krampus,” that even though there’s a clear A, B, and C story, only two of them have to do with Christmas, and one doesn’t really affect the other. I think it would’ve worked better if for this second hour, even being the midseason finale, the serialized story had been finished up in “Cold Blooded,” and this had been a purely episodic affair that somehow tied Krampus and Rosalee’s holiday misgivings into a way to resolve the minor conflict with Monroe. Nick and Hank essentially just investigate a string of robberies, all related to people who were acting “naughty” at the time, and it turns out that Krampus is a rather special type of Wesen. Out of the usual steps in the cops solving the case, that Grimm investigative step—figuring out who Krampus is when outside of the winter solstice—is the one that feels like it shines a light on the darkness of the Wesen world. Nick gets to write another entry in the big books in the trailer, and he takes another first step: handing a case over to the Wesen council. That retroactively allays some of my hang-ups about the exorcism-focused episode last week, picking out one part of it that could have made the show even more weighed down by expansion outside Portland. 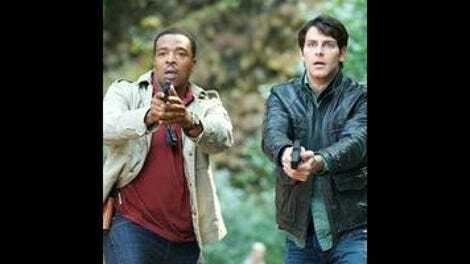 Instead, it’s a small step for Nick and his Grimm authority to interact with the larger Wesen world. That’s a small but hopefully important step to linking the episodic, city-based plots to the international mythology. But more on the supporting romantic and sentimental plot. Monroe and Rosalee are a great couple with overwhelming chemistry. But for some reason that has to translate into the rote false obstacles to their growing romance. Monroe wants to share his love of all things Christmas by surprising her with a fully decorated house—a great comedic feature of the December episodes of the show in previous seasons. But of course, Rosalee hasn’t told Monroe about a traumatic event from her childhood, when her aunt and uncle died in a car crash around Christmas. So that casts a pall over the decorative proceedings, as Monroe takes everything down overnight in order to make Rosalee happy, and which will inevitably be set right, but without any significant understanding—aside from some blatantly expositional tragic monologues. The good things to come out of this rather asinine conflict are the scenes between the men and the women. While they certainly don’t pass the Bechdel Test, it puts Juliette in the position of helping Rosalee work through her emotions, and gives Monroe a chance to use Nick and Hank as a sounding board. I’m really surprised that Juliette, in the span of only eight episodes, has been largely rehabilitated from the anchor dragging the show down to only the weakest link in an improving cast. So this is the midseason finale of Grimm, with only eight episodes airing before a brief winter break. (The show returns on January 3.) In these eight episodes, the writers brought Rosalee and Monroe closer together, largely fixed the Juliette problem and brought her into the group, and found a replacement Big Bad to loom large in a few 30-second scenes every couple weeks. Now the next step is for Grimm to figure out how to balance the episodic Grimm progression in Portland cases with bringing Nick and his friends onto the larger Wesen conflict plane. The goal seems to be for Nick to become the Grimm that changes Wesen life forever because he deals with conflict differently than any of his ancestors. Maybe it’s time to see him do something other than kill the Verrat assassins sent take him down.